Interviewed Pat effing Benatar for Inspirer. Don’t call her Princess Leia. Call her Queen Clap Back. 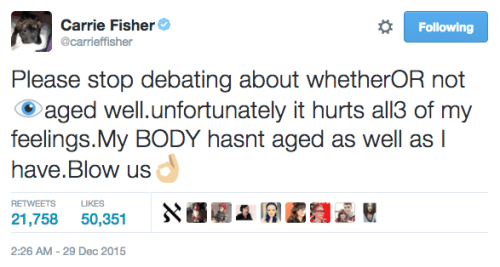 Never one to bite her tongue, Carrie Fisher took to Twitter this week to call out people critiquing her appearance in Star Wars: The Force Awakens. Quelle surprise — the 59-year-old actress doesn’t look the way she did when she first stepped into the iconic role at age 19! It’s been nearly 40 years since A New Hope was released. You would think most people would understand that most normal people age a fair amount in that time frame, but I guess not. When her clap back tweets got picked up as a story for every news outlet from the Washington Post to Entertainment Tonight, the public’s reaction was largely supportive and full of praise. The way we treat women, particularly women in entertainment, as objects of beauty and little more, is sad. It seemed like most corners of the internet were cheering: what a great, you go girl! moment to close out a year of women biting back at body shamers. But the New York Post had a different opinion. Post op-ed writer Kyle Smith asserts that if criticism and judgement of her image bothers her, then Carrie Fisher should just quit acting.